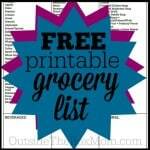 Have you been looking for a grocery list template so you don’t have to keep making a grocery shopping list every week? 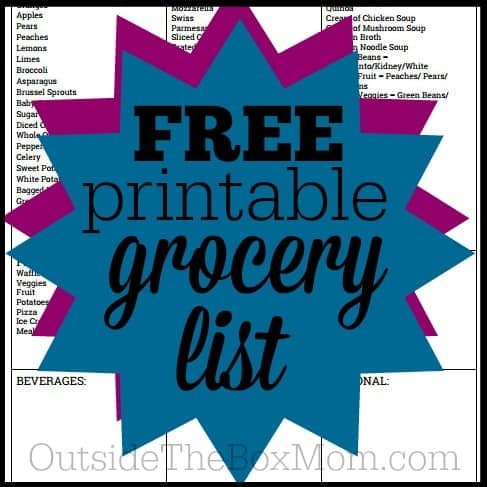 Download this Free Printable Grocery Shopping List today! Grocery shopping is a necessary evil. We all have to do it. But how much it costs you and how long it takes you is completely negotiable. I have found that grocery shopping causes the least headaches when paired with a simple plan. Track items as you run low. Don’t wait until you run out or you will pay full price for the items you need. If you determine what makings of a meal you already have, you can finalize it into a plan of what you want to make for the week. Once you make a list of any items you still need, pay attention to items on sale this week. Use coupons to stretch your grocery budget (visit sites that offer coupon matchups for your store by doing a Google search ( i.e. “Food Lion matchups” or “Food Lion deals”)). Organize the list in the same order as the aisles. Organize the list in the same order as the aisles. Aim for the lowest prices on each item you buy. Set a weekly, bi-weekly, or monthly shopping schedule and stick to it. Grocery shopping causes the least headaches when paired with a little planning. As you shop, be open to any brand. Be willing to pass if the item is too expensive (i.e. not on sale or if you don’t have a coupon). Make substitutions if possible (i.e. you want butter, but could use margarine). Shop once weekly, bi-weekly, monthly, etc. The quick “run-in-the-store-to-get-one-thing” trips will kill your budget. Keep the 6 week sales cycle in mind, only stocking up to get you through that time period. One of my favorite ways to stretch my dollar is to buy SCOTT® Paper Towels . The Select-A-Sheet feature reduces waste and the bonus packs reduce the number of shopping trips. If you’ve read this blog for any length of time, you likely know I am a die-hard deal finder. Can you imagine my excitement when I learned that one of my favorite stores, Dollar General, offers Digital Coupons?! You, too, can save on SCOTT® Towels and Bath Tissue with DG Digital Coupons. Check out your local Dollar General to find SCOTT® Paper Towel and SCOTT® Bath Tissue bonus packs. SCOTT® is an affordable, but premium brand that wants to help you cut through the clutter when purchasing for your family. SCOTT® is the simple and reliable choice that will always deliver on what you are expecting. My son uses paper towels to clean our glass dining room table, line the kitchen trash can to catch an unexpected spills, and to clean the bathroom mirrors, sink, and exterior toilet surfaces. 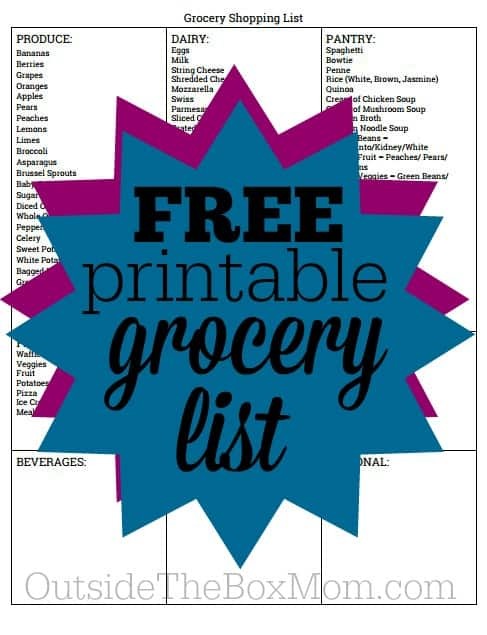 Easy ways to save on great products such as SCOTT® through DG Digital Coupon offers! Bonus packs can help you save even more by stocking up on SCOTT® at Dollar General. SCOTT® Brand is a superior product with no frills – just the perfect choice for your paper product needs! 1. Sign up at DollarGeneral.com or visit the DG App. 2. Create account and load which SCOTT® coupons you would like to use. I was surprised how easy the process is! I’m even more excited to save on other great brands at Dollar General. Bonus Packs: Find 3 special SCOTT® Bonus Packs in-store through the end of February. 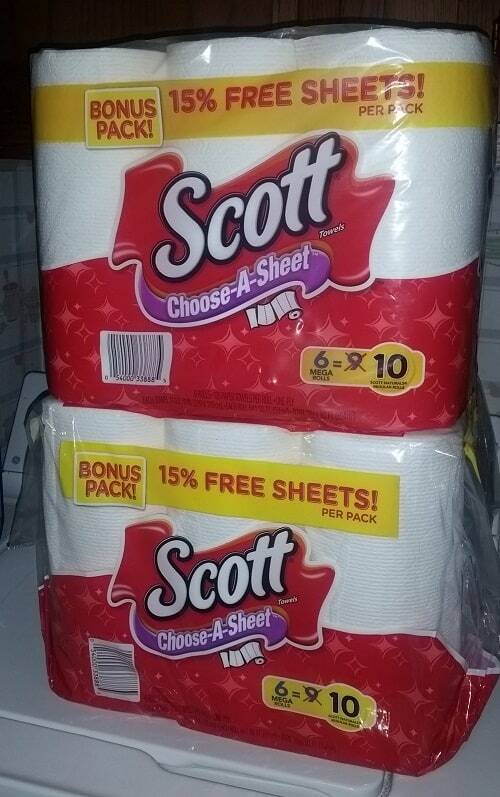 Back in October, I bought 36 count package of SCOTT® 1000 Bath Tissue (with the bonus 100 sheets per roll). I still have about 10 rolls left!!! What’s your least favorite part of grocery shopping?